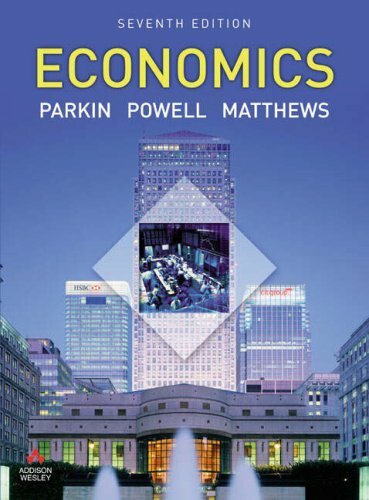 Economics Seventh Edition Parkin Powell Matthews Think like an Economist! Economics touches almost every aspect of life, from climate change, terrorism and the development of new drugs, to taxes, house prices, wages, what to eat for dinner and how much time to spend studying. Thinking like an economist will enable you to understand human behaviour, make more informed decisions, and evaluate economic policies. The leading economists in the news today started out like you, as students taking a course in the principles of economics. Like them, you can learn to think like an economist, and this book will show you how. Economics, Seventh Edition, introduces the central ideas of economics and explains them using a straightforward, precise and clear writing style. The authors put the principles to work by repeatedly using them to illuminate a wide range of current real-world problems and issues.Features of this book include: *Economic analysis of news articles and case studies to show how economic principles can be used in practice to understand the forces that shape our world *Boxes to connect economic principles with real world data and events *Review questions, end-of-chapter Problems, Critical Thinking exercises and Web Activities to test your understanding *Figures to illustrate and reinforce the key ideas *Mathematical notes to strengthen your grasp of key principles *Interviews with leading economists to show what inspired them to study and pursue careers in economics This is the ideal textbook for university students learning the principles of economics. MyEconLab -- www.myeconlab.com/europarkin -- an unrivalled study and testing resource, generates a personalized study plan and provides extensive practice exactly where you need it. Guidance is provided with step-by-step explanations and animated graphs that are constantly at hand for you to strengthen your grasp of the subject and prepare for your exams. With its distinctively European flavour, this text provides a comprehensive treatment of core micro and macro economic principles and ideas.These are nicely supplemented with insightful case studies and the application of economic concepts to real world situations. The accompanying online resource MyEconLab is an excellent source of information and is an invaluable study aid. This book is highly-recommended reading for students taking a first course in economics. "Dr Phil Tomlinson, University of Bath, UK" The authors are to be congratulated on producing a highly readable and comprehensive coverage of the central issues in economics. The thoughtful combination of theory, examples and real world application is superb. "Professor Steve Cook, Swansea University" Economics is a great introductory text that stimulates interest in economics and encourages further exploration. MyEconLab is packed with useful teaching and learning resources and makes it an attractive journey for both students and teachers. "Dr Jen Snowball, Rhodes University, South Africa" " " Michael Parkin is Professor Emeritus at the Universityof Western Ontario and author of the best-selling US textbook, Economics, now specially adapted in European, Canadian, Australian, French, Latin American and Chinese editions and used by over a million students across the world. Melanie Powell is Reader in Economics at Derby University Business School Kent Matthews is the Sir Julian Hodge Professor of Banking and Finance at the CardiffBusinessSchool.